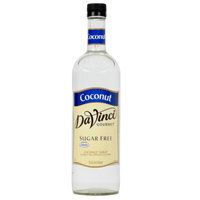 This user-friendly bottle of DaVinci Gourmet sugar free coconut flavoring syrup allows your busy baristas to quickly and easily serve up delicious hot, cold, or blended drinks with irresistible flavor without the sugar content! DaVinci Gourmet flavoring syrups complement your beverages without overpowering them or being too sweet. They are specially formulated to resist curdling in milk and hold up well under heat, making them the perfect choice for espresso-based drinks, brewed coffee or tea, and more. The coconut flavoring is one of my favorites. It has a great aroma to it and the flavor comes through nice and strong. Perfect for mixing into cake batter. I really like DaVincis regular coconut flavor but I'm trying to make more drinks with less sugar. This sugar free coconut has been a very good substitute. Sugar free coconut flavoring was hard to find in our local stores so thrilled to order online. The flavor is amazing and goes great in hot cocoa. Everyone who loves coffee really needs to give this sugar free coffee flavoring syrup a try. It is really good and I can not get enough of it. Every time I make coffee, this is the flavoring syrup that I always use. The sugar free coconut syrup for flavoring coffee is top notch. A great coconut flavor that blends really well with coffees and cocoas. A nice find for no sugar diets. Coconut is a good flavor. Many liked this one in coffees and cocoas, hot and cold. They also enjoyed it in milkshakes. I do not like splenda. I love this flavor (coconut sugar free), it match perfectly with the warm and cold coffee. I also recommend you buy the syrup pump for measuring the syrup. I can't say enough about this coconut syrup. Just the smell alone says it all. I go through a bottle a week sometimes. Perfect flavor.